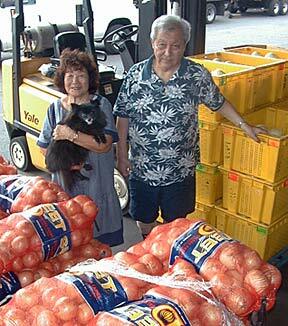 Hilo Products company pioneers Henry Suzuki and his wife, Sadako, stand amid bags and boxes of onions, one of the vegetables handled by the family business. HILO » As an 8-year-old girl, Sadako Suzuki was able to keep her orphaned brothers and sisters together. As a teenage delivery man for his father's distribution company, Henry Suzuki bought bread from bakers at a discount, doubling his profit despite World War II price controls. Together, the husband and wife team built Hilo Products Inc. into a strong company while raising hardworking children who continue to make the family business a success. "It's not a bad life," said their son Craig, despite the fact that he works 15 hours a day, Monday through Friday, plus more hours some Saturdays. His sister Susan added, "It was a hard life." Henry Suzuki says the only "vacation" he ever took was when he was drafted into the Army in the closing months of World War II. A normal workday for Henry involved leaving home at 4 a.m. and coming back at 9 or 10 p.m., Sadako said. "He never did see his children. I tell him he's lucky because the children grew up to be good," she said. Even on Christmas or a child's birthday, Henry would be at work. The family had to send someone to bring him home, Sadako said. "Work was my hobby," Henry said with a grin. Sadako worked the same long hours, leaving work only briefly at 7 a.m. to take the children to school. Both sides of the family suffered hardship and heartbreak from the earliest days. Although Henry was born on Oahu at Kahuku, his father, Reiji, moved the family to Molokai in 1930 when Henry was 5. At 11, he began his working life, picking pineapples. One Saturday his mother, Ogin, felt a sharp pain in her abdomen. A nurse called the plantation doctor who was dancing at a party. He told the nurse to put an ice pack on the painful spot. The doctor came to the clinic hours later, but Ogin's appendix had ruptured. An emergency flight took her to Honolulu, but doctors could never quite cure the damage. Henry's mother lingered for a year before dying at age 36. In 1938, his father moved to Hilo with his five children and a new truck he had ordered to deliver produce. He also distributed products from Japan such as combs and razors, so Reiji Suzuki called his new company Hilo Products. Henry became an unpaid worker at age 13, claiming to be 15 to get his driver's license. Meanwhile, Sadako Ishizaki was growing up in North Kohala without her father, who died of a heart attack. Her mother had constant bleeding from the birth of her last child, and she eventually died at a hospital in Honolulu. The four Ishizaki children were split up and sent to a series of foster homes in Hilo. Finally 8-year-old Sadako scrabbled into the tiny crawl space under her foster parents' home with her 6-year-old brother and refused to come out until all the children were reunited. Her stubbornness worked, but with four children of their own, foster parents Harry and Aiko Daikawa now had eight children to feed. Sadako began work at age 10, picking flowers to make leis. She started work at Hilo Products at 16. "When I started working for them, I worked late," she said. At 21, she married Henry. The 1946 tsunami destroyed the family's store in the Waiakea Town part of Hilo. They rebuilt, but were wiped out again in the 1960 tsunami. They moved to their present site in the Kanoelehua Industrial Lots after that. Henry's father died in 1957. When Henry suffered a stroke in 1977 at age 52, he was out of work for three months. On New Year's Day, 1978, he returned to work, now working "only" 12 hours a day. Henry called it his "half-day" schedule. The four children hadn't shown much interesting in running a produce company, but after the stroke, three of them helped continue operations. The fourth asked if he should come home from Honolulu, but Sadako told him to stay where he was. At age 80, Henry now works three days a week. He tried stopping altogether, but he had headaches for months. Finally he came back to work. "Headache's gone," he said. When Sadako celebrated her 76th birthday recently, the family got her a cake despite her protests that she didn't want one. "I've got everything I want. Just be good," she told them.